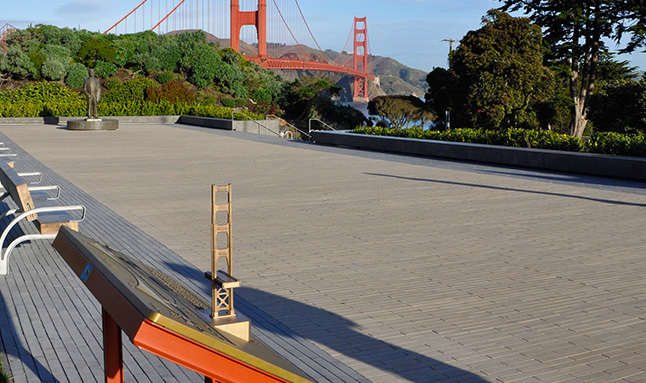 Cinnabar produced an outdoor tactile model of the Golden Gate Bridge in collaboration with CUREE and the Lighthouse for the Blind. Using 3D modeling software, we produced the final layout and digital files for casting the exhibit elements in silicon bronze. Using a local Los Angeles foundry, we managed the production process and were responsible for the post-casting finishing and assembly. 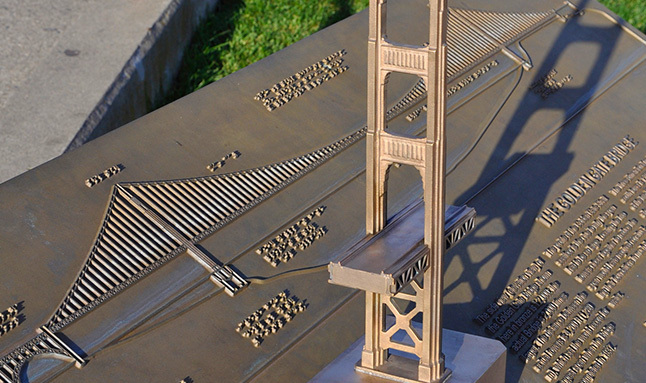 The piece consisted of a relief elevation of the bridge, Braille & English text and a scale model of the bridge’s iconic south tower. The purpose of the tactile exhibit model was to provide a hands-on tool for describing the bridge to the visually impaired. Working closely with the client, we placed and verified the readability of the Braille text and devised the structural assembly sequence for the finished exhibit elements. The resulting piece is something that can be appreciated by all and one that will continue to evolve as the unfinished bronze develops natural patina and burnished wear patterns from visitor interactions.